Opened in 2007 and featuring Las Vegas�s second authorized Lamborghini dealership, the Palazzo � Hotel Las Vegas has all the styling of Italy and is a perfect complement to its neighbor The Venetian Hotel. Each of the Palazzo � Hotel Las Vegas 3068 rooms is decorated in luxury making sure that a guest is sure to return to The Palazzo � Hotel Las Vegas soon. The bedding too was not overlooked as The Palazzo worked with Down Etc. � and their premium 75/25 White Goose Pillow. The Down Etc. � 75/25 White Goose Pillow uses a premium 235 thread count 100% cotton cover and a full fill of 75% White Goose Feather and 25% White Goose Down. This blend achieves amazing loft but the high feather content means you will get the right amount of support to keep you sleeping soundly all night long. Give your bedroom a Palazzo � Hotel makeover with the Down Etc. � 75/25 White Goose Pillow tonight! The Palazzo � mark is owned by Las Vegas Sands Corporation. ; this trademark is not owned or licensed by HotelPillow.com. The Palazzo � mark is used on this website for descriptive purposes to inform customers that the Down Etc. 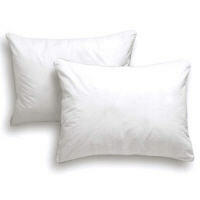 75/25 � Pillows sold by HotelPillow.com is the same pillow found in Palazzo Hotel � properties. The Down Etc. 75/25 � Pillow is not manufactured by Las Vegas Sands Corporation �.